This giant sized bulldozer - probably World's largest, is a two storied, 6 room, 2,400 sq. foot (223 Sq. 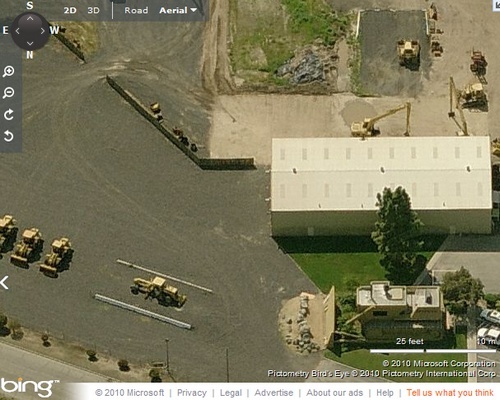 metres) headquarter office building of the United Equipment Co - a construction equipment company in Turlock, California. Built in 1976 it is 21.5 feet (6.55 metres) high, 28 feet (8.53 metres) wide and 66 feet (20.17 metres) long. Made of redwood and plywood it is a big landmark and a good advertisement for the company who are in business of selling/renting construction equipment. The company has adopted it as their logo also. 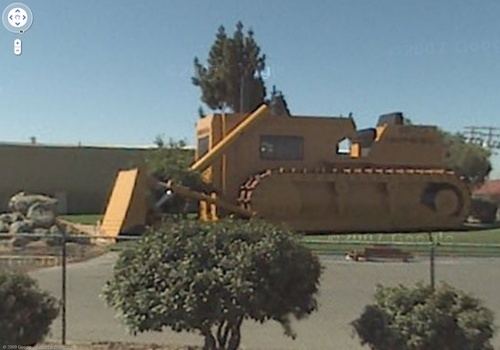 Giant Bulldozer in Google Earth Community (GEC) Forum. Credits: Farceur - A Member and World Explorer of GEC whose post brought it to my knowledge. Thank you Farceur.